The stomach secretes digestive fluids with a pH2 value, which creates a highly acidic environment. These acidic gastric secretions sterilize bacteria in foods that are eaten, and are essential for the digestion and absorption of various nutrients, including protein, iron, calcium, and vitamin B12. Obviously, stomach acid that can digest food can also damage delicate intestinal mucosa. The body has protective mechanisms—including mucosal mucous/bicarbonate secretion and sphincter contraction of the gastroesophageal junction—to prevent gastroesophageal damage. But if the sphincter is weakened, stomach acid can flow back into the esophagus. The backwash of acid irritates the esophageal lining, causing heartburn and the regurgitation of food. If the condition persists, it may cause chest pain, difficulty swallowing, chronic cough, hoarseness, and disrupted sleep. Left untreated, GERD can lead to esophageal ulcers, narrowing of the esophagus, and precancerous changes known as Barrett’s esophagus. A recent New England Journal of Medicine review of prophylaxis for upper gastrointestinal bleeding among hospitalized patients showed that not only is acid suppression commonly used without indication in the intensive care unit (ICU) and medical wards, but that these medications are frequently continued after discharge. For example, studies have shown that more than 60% of patients transferred from the ICU to the wards were continued on prophylactic acid suppression without indication. not limited to the inpatient setting. 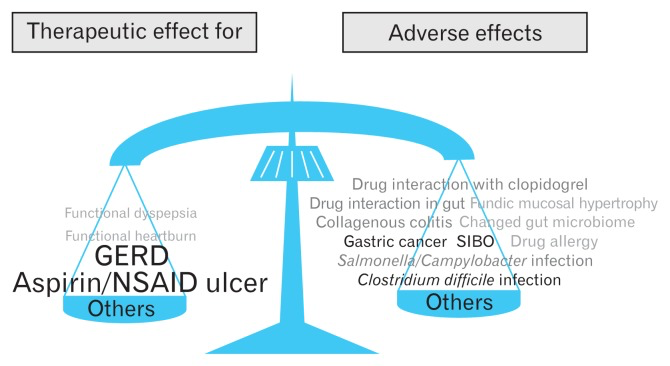 A series of studies have demonstrated that roughly 50% of outpatients on chronic proton pump inhibitors do not have indications for these medications.6 That is an enormous number of people taking medications that are unnecessary and potentially harmful. Suppressing stomach acid secretion for long periods can have serious unintended consequences. Pepsin, an enzyme essential to the preliminary digestion of protein, needs an acidic environment to be effective. The strongly acidic hydrochloric acid pumped out by cells in the lining of the stomach also plays a direct role in the initial digestion of some foods. And stomach acidity is a built-in barrier to infection. PPIs are one of the most difficult classes of drugs to wean people from, and therefore are highly addictive. You might wonder how a drug for suppressing stomach acid can be addictive. Imagine the PPI acting like a dam for a river. When the dam is created, a lake forms behind it. When the dam is removed, the water from the lake floods downstream. In a similar way, stopping the use of PPIs causes the suppressed stomach acid to flood the digestive system, and symptoms return with a vengeance. The result? Most people return to using PPIs, and the cycle continues. 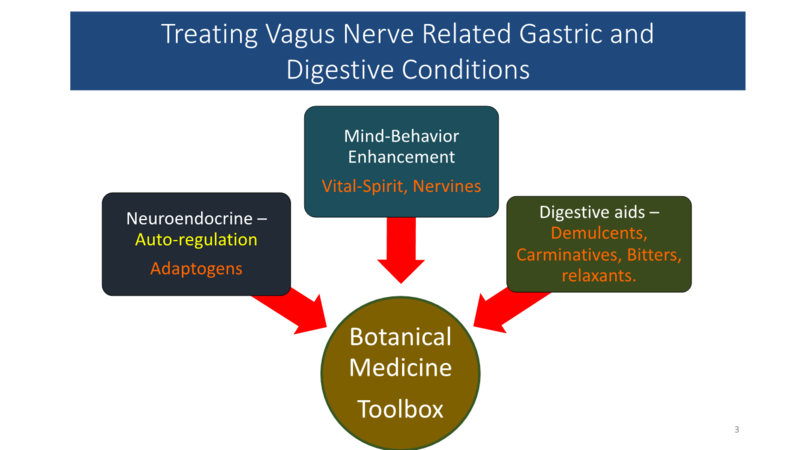 In my clinical practice, I find that the best approach for treating GERD and other digestive system issues related to excess stomach acid is to gently regulate stomach acids, while simultaneously modulating and strengthening the nervous system. Herbs, with their pleotrophic effects, are an excellent choice for supporting both the nervous system and the digestive system. 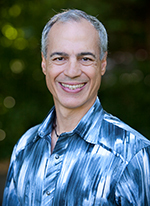 Through extensive research and clinical observation, I’ve developed a treatment protocol for GERD and other digestive tract disorders that help to restore the body’s natural self-regulatory abilities. Of these, chamomile and lemon balm offer the additional benefit of supporting the nervous system, and address the important connection between the digestive tract and the nervous system. Other nutrients that I’ve found beneficial for digestive health include glutamine-magnesium-glycine chelate, zinc carnosine, potassium bicarbonate, and sodium alginate. Formulas that include an array of botanicals and targeted nutrients provide a comprehensive, balanced approach to GERD and other gastrointestinal disorders. 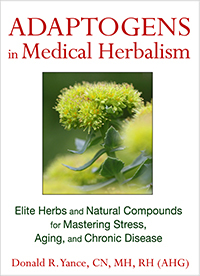 Licorice (Glycyrrhiza glabra) may be the best-known botanical for addressing GERD. Licorice has been used medicinally for thousands of years in both Eastern and Western medicine to treat a variety of ailments, including GI problems. I’ve long used licorice in my practice, and prefer deglycyrrhizinated licorice root (DGL) extract, which has been processed to remove the steroid-like compound glycyrrhizin. This prevents the potential problems of edema and hypertension that susceptible individuals may experience when taking large amounts of licorice. DGL both relieves symptoms and promotes healing of ulcers, GI inflammation, heartburn and mouth sores. I’ve been recommending DGL for thirty-plus years for gastrointestinal issues including heartburn/indigestion, ulcers, and in mouth rinse solutions. 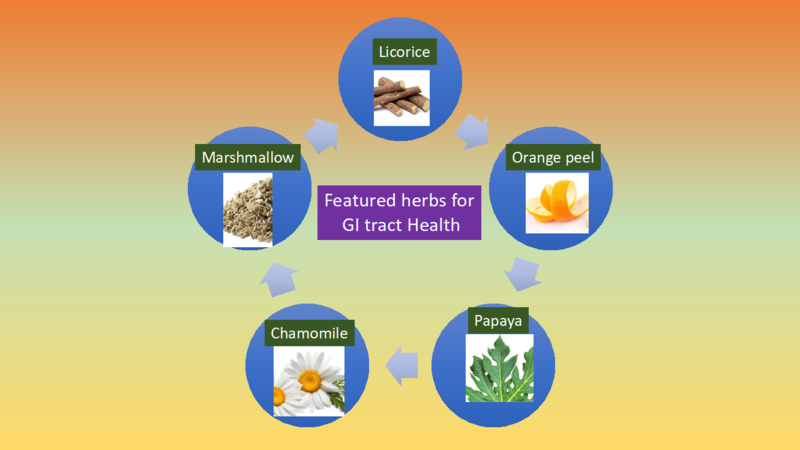 My patients who suffer from heartburn, peptic ulcer disease, or gastritis have found great relief from using DGL. In evaluating the usage of PPIs in both hospital and outpatient settings, it is obvious that these drugs are increasingly being prescribed as a first-line treatment for GERD and other gastrointestinal issues related to excess stomach acid. As I mentioned previously, the long-term suppression of stomach acid secretion has significant negative health consequences. A much better approach is to use botanicals and nutrients that regulate stomach acid naturally and concurrently, support healthy gastrointestinal function. Lam JR, Schneider JL, Zhao W, Corley DA. Proton pump inhibitor and histamine 2 receptor antagonist use and vitamin B12 deficiency. JAMA. 2013;310:2435-2442. 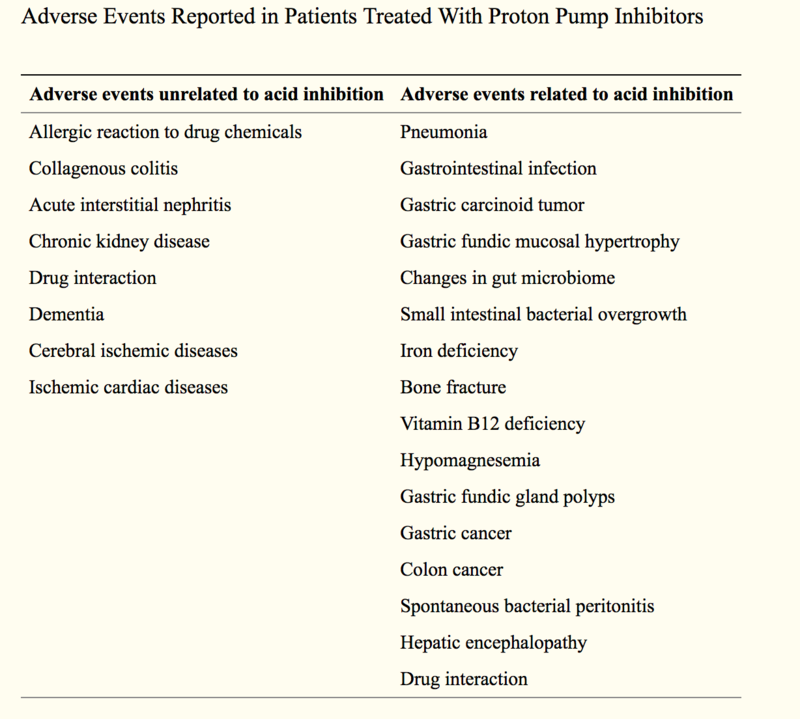 Weintraub, Karen, Do PPIs have long-term side effects? (March 18, 2016), Harvard Health Publications. 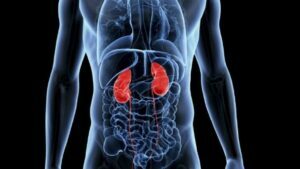 Studies Link Some Stomach Drugs to Possible Alzheimer’s Disease and Kidney Problems – Scientific American, February 1, 2017. Hong­Xing Wang, Yu­Ping Wang, Gut Microbiota­brain Axis, Chin Med J (Engl). 2016 Oct 5; 129(19): 2373–2380. O’Mahony SM, Marchesi JR, Scully P, Codling C, Ceolho AM, Quigley EM, et al. Early life stress alters behavior, immunity, and microbiota in rats: Implications for irritable bowel syndrome and psychiatric illnesses. Biol Psychiatry. 2009;65:263–7. doi: 10.1016/j.biopsych.2008.06.026. 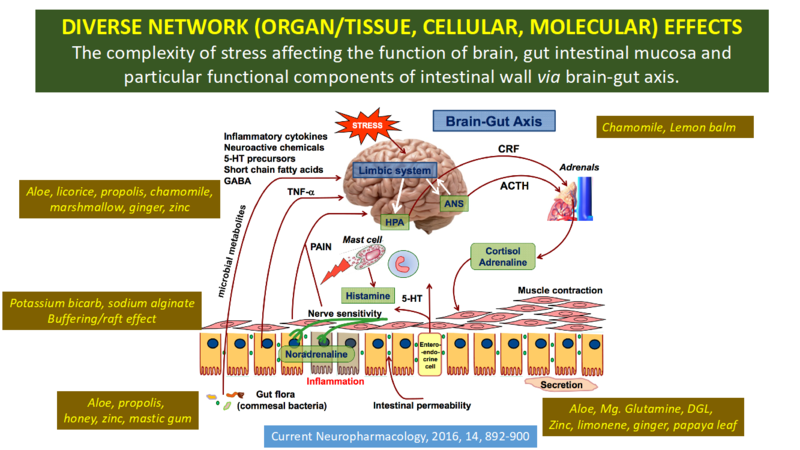 Sudo N. Stress and gut microbiota: Does postnatal microbial colonization program the hypothalamic­ pituitary­adrenal system for stress response? Int Congr Ser. 2006;1287:350–4. doi: 10.1016/j.ics.2005.12.019. Melzer J, Rosch W, Reichling J, et al. Meta-analysis: phytotherapy of functional dyspepsia with the herbal drug preparation STW 5 (Iberogast). Aliment Pharmacol Ther. 2004;20:1279-87. Dehpour AR, Zolfaghari ME, Samadian T, Vahedi Y. The protective effect of liquorice components and their derivatives against gastric ulcer induced by aspirin in rats, J Pharm Pharmacol. 1994 Feb;46(2):148-9. Russell RI, Morgan RJ, Nelson LM. Studies on the protective effect of deglycyrrhinised liquorice against aspirin (ASA) and ASA plus bile acid-induced gastric mucosal damage, and ASA absorption in rats, Scand J Gastroenterol Suppl. 1984;92:97-100. Excellent article. Both I and my wife had GERD many years ago and my wife was also diagnosed with Barret’s. We both recovered using DGL. Her gastroenterologist dismissed her recovery based on DGL use. I have recommended DGL to many folks over the years but not one was willing to give it a try.